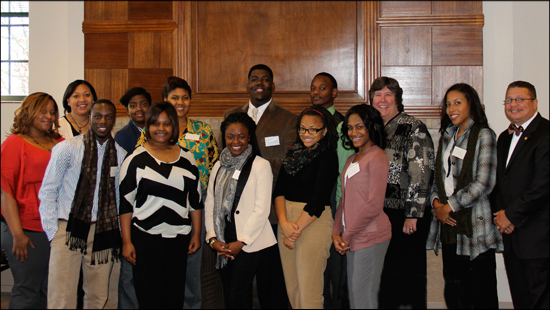 The 2012 Fall Campus Visitation took place in November, with eleven students visiting from universities in the South. Each year the Graduate College’s Tony Dennis, Director of Graduate Student Recruitment and Retention, recruits promising students from Historically Black Colleges and Universities (HBCUs) in the science, technology, engineering and mathematics fields (STEM), as well as the social, behavioral and economic sciences (SBEs). This year the students met with the Graduate College staff in the morning of Friday, November 9, then went on to a panel discussion with faculty members Mark Orbe, Communication, Dave Louis, Educational Leadership, Research, and Technology, and Mary Z. Anderson, Counselor Education and Counseling Psychology. Panel members discussed graduate school and faculty expectations and planning one’s graduate career. At an informal luncheon, students interacted with faculty members, talking about mentoring, graduate education and departmental culture, working in research groups, the importance of disseminating one’s research to the community, and broadening participation with collaboration across disciplines. After lunch, student visitors went to their respective departments, where they had a chance to get a tour, meet faculty and administrators, and find out more about their departmental culture and resources. The student visitors, their college of origin and their program interest at Western Michigan University are Mr. Jeremy Donnell, from Jackson State University, Physician Assistant program; Ms. Mikaela Pitcan, University of Florida, Counseling Psychology Ph.D.; Ms. Jana Bailey, Jackson State University, Science Education MA; Mr. Darryl Jefferson, Jackson State University, Health Informatics, Physician Assistant, or Public Administration; Ms. Alannia Mosley, Dillard University, Counseling Psychology; Ms. Lisa Landry, Dillard University, Clinical Psychology; Ms. Ana Stepney, Dillard University, Sociology with a concentration in Social Work; Mr. Randall Willis, Oakwood University and University of Alabama in Huntsville, Applied Mathematics; Ms. Kayla Williams-Rawlinson, Oakwood University, Counselor Education MA; Ms. Keila Miles, Oakwood University, Biological Sciences; and Ms. Candace Farrell, Oakwood University, Applied Mathematics.